BRL Test is your authorized Com-Power distributor. Call 407-682-4228 to order. Ususally ships same day. The LI-220A Line Impedance Stabilization Network (LISN) provides the necessary measurement platform for performing power line conducted emissions compliance testing as required by most worldwide standards for commercial products. The LI-220A is compliant with both CISPR 16-1-2 and ANSI C63.4. The LISN provides defined stable impedance and isolates the EUT from power source influences, thereby providing accurate and repeatable results. The LI-220A includes one pair of single-conductor networks, housed together, to be installed in series with each current-carrying conductor in a single- phase, dual-phase or DC power system. A second LI-220A pair can be used to accommodate 3-phase power systems (Wye or Delta configurations). This LISN uses air-core inductors to prevent saturation and permeability variation. The mounting plate of the LI-220A is left unpainted in order to facilitate connection to earth ground in its installation, which is essential due to high leakage current. 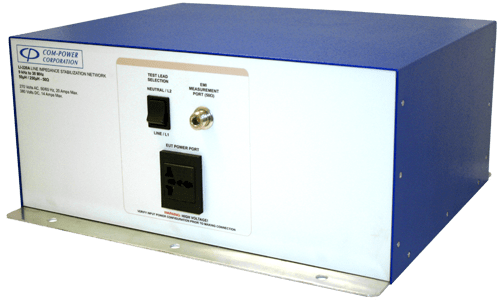 Use of a Transient Limiter for impedance matching, reduction of out-of-band emissions and transient protection for your measurement instrument is highly recommended and available from Com- Power. All Com-Power LISNs are individually calibrated in compliance with the relevant requirements of CISPR 16-1-2 and ANSI C63.4. Impedance, Phase, Isolation, and Insertion Loss data is supplied with each unit, along with the calibration certificate. fitted with a standard IEC C20 receptacle. single-phase, dual-phase and even three-phase systems. which further attenuate any out-of-band emissions. accredited calibration is also available upon request.